In a new walk-through video, Microsoft has given us a run through of the changes set to hit Windows 8 devices with the launch of Windows 8.1. It doesn't show off anything particularly revolutionary or that we didn't know was coming - new tile sizes! apps you can reposition! background colours! - but is a pleasant sneak peak at the changes that should be released later this month. One thing that's significant in its absence from the video is the return of the Start button, which has had Windows fans frothing at the mouth. Presumably this is still set to make an appearance in the software update, as promised by Microsoft last month. We'd imagine so, given that we've already seen the boot to desktop Start button combo leak in some Windows 8.1 images. 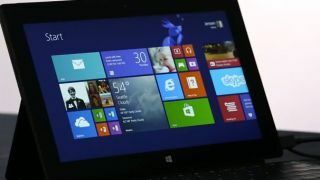 Windows 8.1 (previously codenamed Blue) will be released as a free download at Microsoft's Build conference which takes starts on June 26.